An island in the Red Sea, known in antiquity as Topazion, probably the modern island of Zeberget, gave Topaz it's name. The stone was at one time predominantly found there, but now the major sources are Brazil, Nigeria, Australia, Burma, and Mexico. True Topaz is found in shades of colorless to yellow, orange, red or brown, and is sometimes treated by irradiation to produce blue colors. 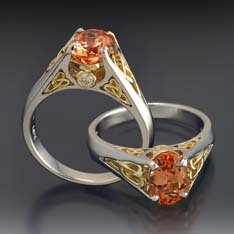 The term Imperial Topaz refers to stones with a fine peachy to reddish orange color. It should not be confused with Citrine or Smoky Quartz, both of which are sometimes erroneously called Topaz. The old traditions hold that Topaz bestowed many benefits upon its wearer. It would relieve bad dreams, dispel cowardice, calm the temper, cure madness and plague, and sharpen the wit. It was thought to aid in sleep and eliminate nightmares, as well as cure rheumatism and soreness in the joints. Topaz was also credited with being effective against bleeding and heart disease. The gem was said to instantly lose its color to indicate that poison was present, thus protecting its owner. Topaz was also thought to bring fidelity and friendship if constantly worn without being set aside. It was also believed to be an effective talisman against accident and fire, and to bring increased intuition and long life. To Christians, Topaz has been known as a symbol of uprightness and virtue. Hindus believe that worn as a pendant, this gemstone will relieve thirst, sharpen intelligence and lengthen one's life. It is thought to be the ideal stone for travelers, protecting them from accidents and homesickness.